Nicole Miller (left) and Mary T. Dougherty at the exhibition "A Philadelphia Store-y: 25 Years of Nicole Miller Philadelphia." in the URBN Center at Drexel University. Acclaimed designer Nicole Miller was born in Forth Worth, Texas, and grew up in Lenox, Mass. Though she says the blood of the nation’s founding fathers courses through her creative veins, she’s never lived in Philadelphia a day in her life. But thanks to Mary K. Dougherty, owner of the Nicole Miller boutiques in Manayunk and Center City, local fashionistas believe in their whimsically printed hearts that the designer is Philly-born and -bred. On Thursday night, Pinkenson, along with more than 150 of the city’s most stylish brass — including former first couple Michael and Lisa Nutter; Karen Buchholz, senior vice president of administration at Comcast; and Emmy-winning TV personality Linda Swain — attended the opening of “A Philadelphia Store-y: 25 Years of Nicole Miller Philadelphia” at Drexel University’s URBN Center. "A Philadelphia Store-y” is the first comprehensive retrospective of Miller’s work presented in a museum space. The exhibit, housed in Drexel’s Robert and Penny Fox Historic Costume Collection Gallery, will be up through the end of August and features more than 40 head-to-toe outfits, including Miller’s designs for our beloved sports teams, and more than 100 of her men’s novelty ties. Nearly all of the pieces are from Dougherty’s private collection, which numbers in the thousands. She donated most of them to Drexel this year after realizing her stash was getting too big. Also in the sartorial mix are drawings straight from Millers’ sketch pad, glossy pictures of Miller that include covers of local magazines, and an ad from the “Philly’s More Fun When You Sleep Over” campaign. Miller attended last week’s fete in a darling frock she designed that was fashioned from silk jacquard with an all-over ticket print circa 1985. During the festivities, Miller was presented with a portrait by local artist Perry Milou. And though she thanked the fashion community in her classic low-key way, it was clear to everyone in the room that it was indeed Dougherty’s night. Nicole Miller listens to Drexel University President John Fry during the openeing reception of her exhibition last week. I arrived at the show a few minutes before the pomp and circumstance to find the usual calm Dougherty all nerves. She was wearing a sheer black Nicole Miller gown from the 2015 collection, with sequined beads snaking up its bodice like vines in a magic forest. We started our mini-tour at the first dais, where a cluster of four, floor-length ball gowns opens the show. One of those gowns, a minty green spaghetti-strap number, Buchholz wore to the Academy of Music Concert and Ball that Prince Charles attended in 2007. Karen Buchholz stands next to two Nicole Miller dresses that she wore to two different Academy Balls. Dougherty, who was born in West Chester, modeled in high school and after graduating took a job at a boutique in her hometown before landing a gig selling women’s clothing for Donnie Davidow’s wholesale company. Davidow is the little-known influential financier behind some of the city’s most successful women’s boutiques, including Knit Wit and now-closed hot spots Plage Tahiti and Sweet Fanny Adams. Mary T. Dougherty walks to the podium during the opening of the exhibition "A Philadelphia Store-y: 25 Years of Nicole Miller Philadelphia" last week. “People thought when I said Nicole Miller, I was saying Nola Miller, the wardrobe designer for Dynasty,” said Dougherty “When I got there, they would be a little surprised." By the late 1980s, Miller was a darling of the fashion industry known for her whimsical prints, above-the-knee silhouettes, and those darned ties. Dougherty was then a top seller, and she saw Miller’s rising star as an entrepreneurial opportunity to go from saleswoman to boss. Miller opened her inaugural Madison Avenue store in 1986 and staged her first New York runway show in 1991. A black-and-white checkerboard dress from that first runway collection is featured in the retrospective. Nicole Miller outfits on display at the exhibition. Dougherty opened the city’s first Nicole Miller Boutique in Manayunk in 1994, and three years later opened the 1,600-square-foot store in the Bellevue. That was just around the time fashion was starting its decade-long obsession with the dress fueled by brands like Milly, BCBG, and Miller, who was inspired by her trips abroad. During that era, another of her signature silhouettes emerged: the ruched tush. Philadelphians ate it up, even though the typical Nicole Miller dress cost about $300, where it pretty much remains today. That price point doesn’t include weddings or ball gowns — during the last 25 years, Dougherty says, she’s dressed hundreds of brides. Several of them, like NBC10 anchor Rosemary Connors, were high-profile Philadelphians. The Nicole Miller label lives in several former first ladies’ inaugural gowns, including Midge Rendell and Lisa Nutter. 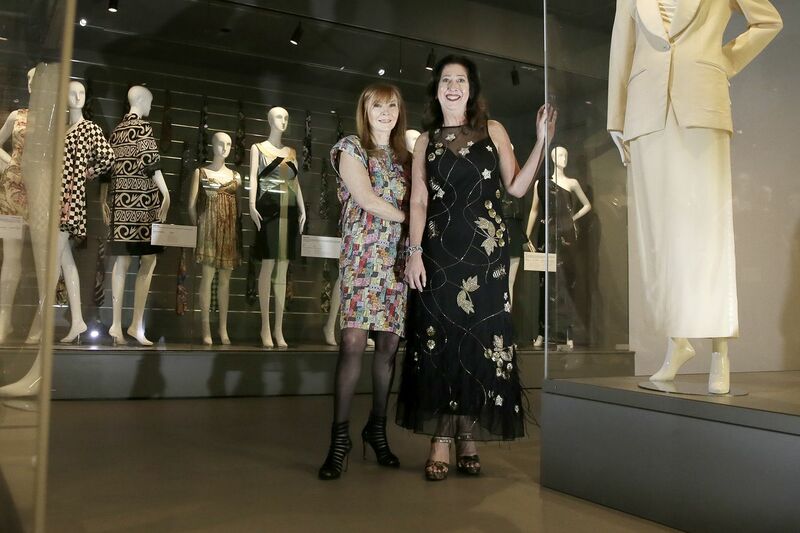 In fact, the mother-daughter dresses that Lisa and daughter Olivia wore to Mayor Michael Nutter’s first inauguration are on display. Dougherty has kept the Miller brand relevant with the city’s favorite pastime sports. In 2014, Miller designed dresses for the Sixers dancers. (Dougherty got one, too.) In late 2017, Miller teamed with Dougherty to design the city’s most coveted piece of high-fashion local sports paraphernalia: the green leather jacket complete with jeweled soaring birds that Dougherty, on a hunch, asked Miller to design in advance of the Eagles’ Super Bowl win. Sixers- and Eagles-themed Nicole Miller outfits. “We had 40 made before they even got to the playoffs,” Dougherty said. “We took a gamble and we sold all 40 of them before they even landed in the store." Two years ago, Dougherty started to think about what she would do with her vast collection of Miller clothing and memorabilia. She thought about selling it. But that didn’t seem right. Perhaps a university? She entered into talks with Drexel.